I'll be honest here when I say I'm not sure why everyone made such a ginormicus deal about this book. I liked it. A lot. It was a quick and cute read that kept me smiling, but I wouldn't put it on the top of the Best Books Ever chart. But that's just my opinion. And since this blog is all about honesty I will begrudgingly admit that my opinion does not dictate the world. Anyways, as I mentioned before, this book is a light and fun read. Evie has a humorous voice that will definitely keep readers interested. However, I didn't feel entirely connected to her. She spends a lot of time talking about ow she wants to be a normal girl, and how she's alone, and blah blah blah, and I felt surprisingly unsympathetic. That actually quite rare for me. I don't feel like she grew much as a character either. She's a little whiny, pretty darn superficial, and not the most intelligent. But, hey, that didn't mean I didn't enjoy her. The plot wasn't exactly riveting or thought provoking, but it was still good. Because, really, who doesn't enjoy a good dose of psycho faeries and girls that are on internal fire. I just sort of feel like the idea that someone is going around and murdering paranormal creatures is a tad...over done. But then again, there aren't a lot of plots that AREN'T over done. At first, I was a little hesitant on the idea of Lend. Being made of water and whatnot. The jacket said shapeshifter, and I hadn't expected it to be a boy that could turn into anybody he wanted. As the book progresses, though, he really grew on me. He's smart and funny, and let's face it, who wouldn't want a boyfrand that can take on any appearance he wants? Completely unique and unexpected. Reth. How do I even begin to explain him? He's something of an enigma, but not the appealing kind. He's sort of psychotic and obsessive. But he's an extraordinary character. He's creepy and tender and just awesome! I like how conniving he is. I think that's an especially essential feature when dealing with faeries. Conniving and cunning and smooth with his words. And always popping up at the worst times. As a romantic option for Evie, I was definitely not rooting for him, but I still love him. There's a huge diversity of creatures, and a lot of them don't fall into stereotype columns which is always good. The way that they are all described is smooth and natural. Just like the writing. Despite my claims of feeling disconnected and Evie experiencing a lack of growth, Miss White still knows how to creatively thread words together and create a fun and refreshing world. I feel like she captured the mind of a teenage girl pretty darn fine. I like that she's not super tough and rough and afraid of vulnerability, but she's also not a little weakling afraid of making decisions and figuring things out. The pacing was pretty balanced and good. There wasn't excessive violence or romance. It all just flowed. In the beginning I thought some of the sentence structuring was slightly awkward, but after about a chapter you adjust and get into it. The ending was a little...odd. And sort of expected. But believe me when I say it could have been, like, 8589565674 times worse. I won't give spoilers, though. If you're not into a cute little fluffy read, I wouldn't advise this book. But if you are and you like something creative that will help your mind escape for a little while, this book is perfect. 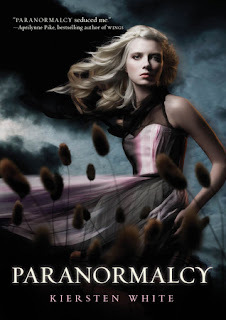 And the ending left me with enough questions (and hunger for Lend and psychotic faeries) to convince me to immediately pick up the next installment, Supernaturally. PSYCHOTIC FAERIES. I don't think I'll ever ever ever get over it. I like my faeries nice and creepy. Well, not so nice...There was a Top Ten Tuesday one time that asked what trends we would like to see more of, an I put down creepy faeries. OB-freaking-SESSED! Unique species. Sick of silly vampire and werewolf love interests? Angels, too? Have no fear, Lend the weird water boy is here! And mermaids. And trolls and hags. SOUNDS LIKE A PARTY! IPCA. It stands for International Paranormal Containment Agency, but that is sort of a mouthful. In my mind I call it ipcuh. :D I like the idea of a secret agency dedicated to containing paranormals.